Despite struggling to establish himself as a first-team regular, it’s reported that Marcus Rashford has no desire to quit Man Utd just yet, but his long-term future could depend on a key factor. The 20-year-old has only managed to start one of the opening four Premier League games this season, and that will undoubtedly be a source of frustration for him. 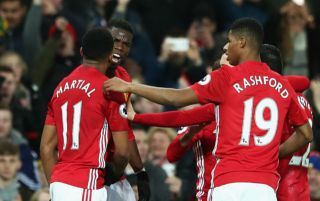 Competition for places is fierce at Old Trafford with the likes of Alexis Sanchez, Jesse Lingard, Juan Mata and Anthony Martial all fighting for places to support Romelu Lukaku up front, and that is where Rashford wants to see a key change made, according to sources at the club. As reported by The Sun, it’s suggested that while the England international has no desire to quit on Man Utd right now, he is eager to play up front or as a No.10 and if he fails to receive those opportunities, then perhaps that could raise genuine question marks over his future at Old Trafford. It’s difficult to see that happening on a regular basis in truth given Mourinho’s faith in Lukaku to lead his line, but time will tell if Rashford gets more chances in that role as the season goes on with the Portuguese tactician having to rotate and rest players to compete on various fronts. Nevertheless, the youngster has arguably regressed and not kicked on as expected after his initial exciting breakthrough in the 2015/16 campaign. Rashford scored eight goals in 18 appearances that season, and has since followed that up with 11 and 13 goals in 53 and 52 outings respectively in the last two campaigns. That shows that he does feature prominently in Mourinho’s plans, but the Man Utd forward is said to want to be in a position where he feels he can showcase his full quality. Time will tell if Mourinho agrees with him and gives him what he reportedly desires.